Watch British TV channels live as shown in the UK or on catchup services likes BBC iPlayer, ITV Hub, All 4, Demand 5 & Sky Go. Watch from wherever you are, on any of your devices. Connect instantly to our UK based VPN or Proxy Server on any of your devices. Watch UK TV live or on-demand for free from wherever you are. 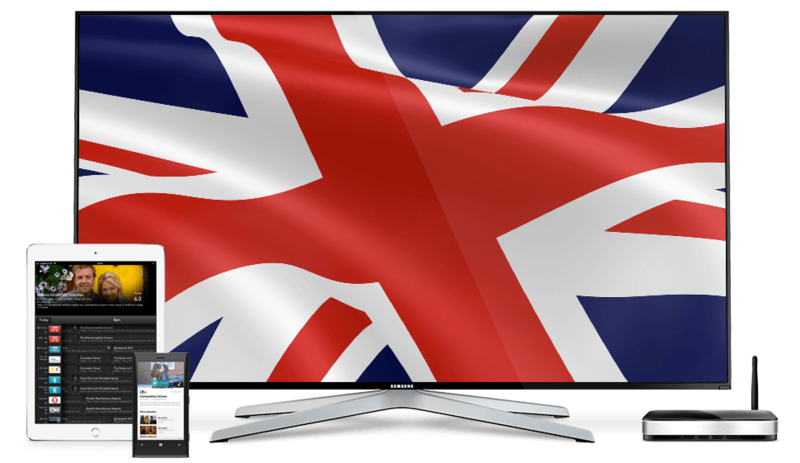 Now watch UK TV from anywhere on any of your devices. What live UK TV channels are available? All the most popular broadcasters now offer live streaming; BBC, ITV, Channel 4, Channel 5, Sky, BT Sport and much more. Their channels are now available on devices such as phones/tablets, computers, consoles & smart televisions. What about UK TV catchup services? On demand is gradually taking over from live tv as the most popular way to watch UK TV; being able to watch what you want, when you want! The UK has an huge range of catchup TV services. BBC iPlayer, ITV Hub, All 4, Demand 5, Sky Go are all available. Sites like Now TV, TVPlayer and TVCatchup offer a mix of live and on-demand UK TV. Is it legal to use a VPN or Proxy to watch UK TV?